We are a Solution – Driven team. Resourcefully smart and ethical in all we do. Innovation to me means thinking outside of the box and finding ways to solve problems or meet the needs of others when everyone else has failed. You can either choose to be innovative and lead by blazing a new trail or you can follow what someone else has done. Everyone knows about the individuals or companies that follow and often look at them as “So what else is new or business as usual or just another face in the crowd “. Individuals or companies that are innovative are viewed with excitement and enthusiasm about the future and the opportunities it presents. People tend to gravitate towards companies and individuals that are innovative since they often exude positive energy and excitement and the promise of great things to come. Being innovative means developing products, services, and solutions that no one else has created. What separates innovation from everything else is either creating something new or improving on something that already exists. It means you are always looking for new ways to accomplish something and always working to reinvent your business or even yourself so you are always leading. I truly believe Sterling Commercial Credit is a great example of a company that thinks outside of the box and is innovative. Livewire, 24- hour funding, and no early termination fees or minimum invoice purchase requirements are just a few of things that come to mind when I think about how Sterling is a leader in the factoring industry. Our leadership team works hard and fearlessly to find financing solutions for our clients when others have said “No” because the only thing the others do is follow industry standards or guidelines. I have seen many instances over the years of our team brainstorming on ideas on how to solve problems and overcome obstacles to provide financing solutions and alternatives for our clients. I know our clients appreciate our efforts and will always remember us for giving them a start and believing in them when no one else would, even when they eventually move on to more traditional financing or no financing at all. Individuals who have tried but failed are remembered for everything they attempted. Individuals who have tried and succeeded are remembered for everything they accomplished. Everyone else is usually remembered for accomplishing nothing. I truly believe the team here at Sterling will be remembered by our clients for believing in them and taking a genuine interest in developing financing solutions tailored for their needs. In the end, their success is our success as well. (of a person) introducing new ideas; original and creative in thinking. Innovation is key to the success of any company big or small. Businesses that innovate can scale up, add more employees, take on more customers and grab a bigger share of the market. 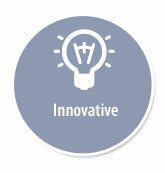 Innovation is imperative when trying to stand out from competitors, meet customer needs and attract the best talent. In my mind, Sterling has always strived to be an innovative company. A few examples throughout the years include Livewire, ops@sterlingcommercialcredit.com, SQL imports, e-mail marketing blasts, Pipedrive and the exploration of new ABL software. I have several co-workers I consider to be “innovative thinkers”. Anyone who put an idea in the bucket to improve SCC has an innovative spirit. A specific example is the Murph creating his pivot tables to efficiently display sales and underwriting data. Another instance is our CEO sitting through several demos to discover the most advanced ABL software available. From the moment I saw that I was to comment on Innovative as a core value I began compiling a response in my head while posting cash. Then I read Mike Austin’s response and was floored by how well his thoughts nailed it! He clearly laid out what it means in terms of Sterling Commercial Credit. I was tempted to just say “what he said”. Well done Mike but extremely tough on those of us who follow. Being innovative in business means that ideas are applied by the company in order to satisfy the needs and expectations of the clients. This requires deliberate application of information, imagination and initiative in deriving greater or different values from resources. When a solution stands out from the rest and truly makes the clients’ lives easier, it is innovative. This is a great strength of our company and sets us apart from banks and other factoring companies. I have watched Sterling grow tremendously in the over 12 years I have worked with this highly innovative company. The core management team that formed our company intended to grow into an innovative leader in factoring from the beginning. They built a team of people who have learned that by forever questioning and examining they can become even more creative and innovative. I am sure that some of our clients would not b living their dream were it not for SCC. 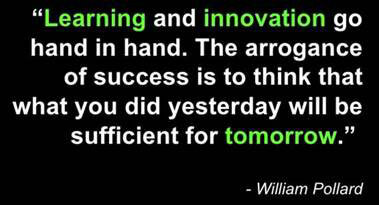 Team Sterling has fulfilled this vision but realizes that being innovative is a work in progress. I am sure Team Sterling will continue to grow and succeed due to their hard work and continuing to strive to be the best and most innovative solution for clients in need of our services. Something that I see spurring innovative thinking within our company is the leadership team. We have tried this before, with different coaches and different members, but this one is different. This team has different ideas from all different backgrounds and together are building and challenging our staff to join in the innovation of the company. I am excited to see the next innovative ideas come from today Sterling Team.